Jimmy Mizen was a young man who went to our nearby Catholic secondary school, St Thomas More in Eltham, who was murdered the day after his 16th birthday, in 2008. From the time of that terrible day, his parents Barry and Margaret have spoken of their faith, their love of God, and their intention to ensure that only good comes from Jimmy's life. Jimmy's mother, Margaret, gave a moving and inspiring talk at Blackfen last year at a Family Day. They have recently set up the Jimmy Mizen Foundation ("Promoting the Good in Young People".) The website is in its early stages with some areas still to be filled out but there is news there of some of the local sporting and other events that have been held to launch the foundation and to raise funds. 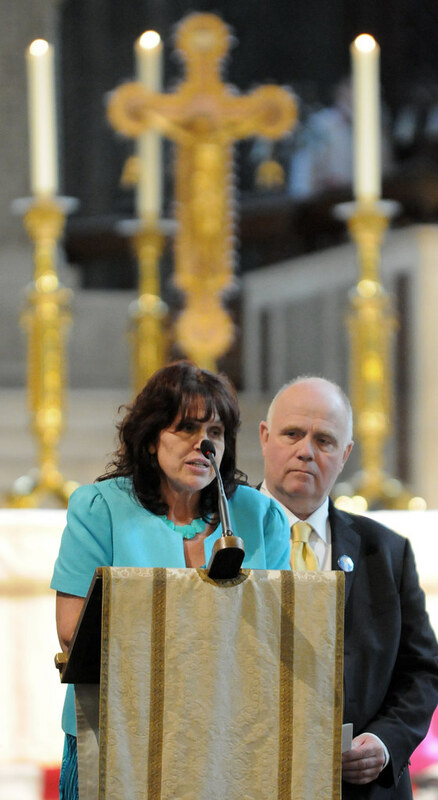 The photo above from shows Margaret and Barry at a service held last May at Westminster Cathedral to mark the second anniversary of Jimmy's death. An ecumenical event, the service was dedicated to all young victims of violent crime in London and to building a legacy of peace.